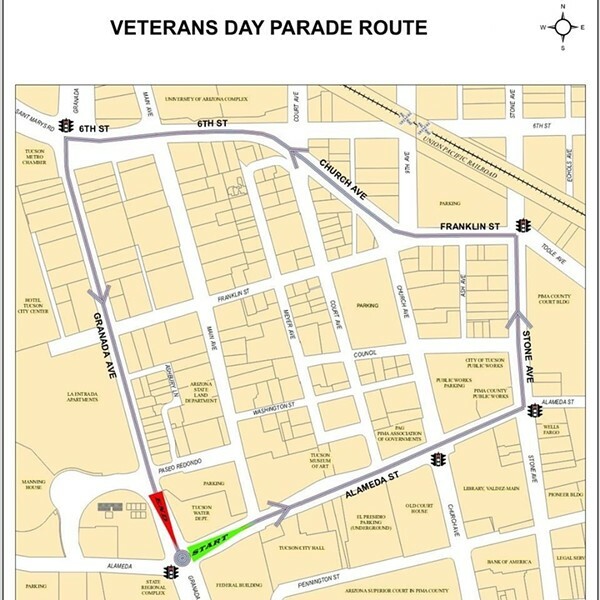 The 99th Annual Tucson Veterans Day Parade will take place on Monday, Nov. 12 at 11 a.m. The theme this year is “Celebration of Armistice Day”. Those entered in the Parade will be judged and awarded trophies in the categories of Senior Color Guard, Junior Color Guard, Senior Marching Unit, Junior Marching Unit, Float (truck and trailer), Decorated Automobiles, Musical Group, Veteran’s Organization, Military Unit and Motorcycle Group. There are over 100 entrants each year of numerous businesses and Veteran organizations including DMAFB, JROTC, ROTC, Sons of the American Revolution and many more. Parade participants will start gathering at 8 a.m. and the festivities will continue to about 1 p.m. The parade begins downtown at West Alameda Street and Granada Avenue. Businesses, parking garages and parking lots will be open. Roads on the parade route will be closed to car traffic during the event. Learn more about this year's parade here. 1. World War I ended on the 11th month on the 11th day at the 11th hour. 2. President Woodrow Wilson named November 11 Armistice Day in 1919 to honor those who died while serving in the military. 3. In 1945, a World War II veteran, Raymond Weeks came up with the idea to honor all veterans not just those who died in World War I. 4. Veterans Day is both a state and federal holiday in the United States. 5. There are 19.5 million veterans in the United States.